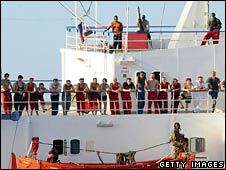 There seems to be no end to the attacks on foreign ships by Somali pirates. Several vessels and their crews are being held off the coast of Somalia. On Saturday, there were two other attacks - one of them successful, with pirates seizing a tug boat. Somali piracy has been transformed from something very basic into something far more sophisticated in recent years. The pirates have graduated from being simple fishermen with rickety boats and maybe a couple of rusty guns into high-tech operators armed with modern weapons travelling in expensive speedboats. They have been able to do this because they have earned so much money from ransom payments. Last year, more than 40 ships were captured, and with ransoms ranging from $500,000 (£341,120) to $2m, they have made a fortune. One pirate, Yassin Dheere, recently said he had made $250,000 from a single incident. Some of the money has gone on fast cars, new houses and lavish wedding parties, but much of it has been spent on equipment. One reason why the pirates can now operate hundreds of kilometres out to sea is that they can afford faster, more robust boats and satellite tracking systems. Pictures of pirate villages show fishing boats left disintegrating on the beaches, abandoned by their former owners who now take to sea in speedboats, hunting for hostages rather than fish. Despite the existence of a United Nations arms embargo against Somalia, the pirates have had no trouble in getting their hands on large quantities of military equipment. After 18 years of civil conflict and no effective central government, the country is awash with weapons, easily purchased in the markets. The longer piracy goes on, the more experienced they will become, devising ever-more ingenious ways of seizing enormous ships with their precious cargoes. And as the pirates themselves say, piracy will only end in Somalia once the country gets an effective and stable government.